Accessible from Helford, the Glendurgan Garden is a must-see. Within the walls of the National trust site, you’ll discover a variety of unusual species of flowers and plants. The paths meander and you’ll find a few hidden surprises like the ‘boat seat’ tucked away amongst the foliage. 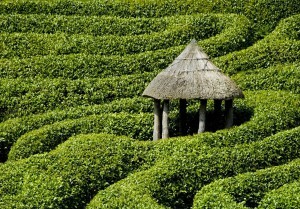 There’s even a laurel maze to explore. I’d say this was perfect for children, but a group of four adults had fun racing each other to the middle. The cafe at the top of the garden is lovely and has a fabulous selection of cakes. There’s also a little shop selling crafts and National Trust stuff. Entry to the garden is £6.80 for adults and £3.50 for children, but there are family tickets available and free entry for under 5’s. Tie a visit in with a trip to the Helford River and you’ve got a lovely day out for all the family.